Jonathan Pollard, recently freed after spending half his life in jail on charges of spying for Israel, is to speak to members of the Conference of Presidents of Major Jewish American Organizations next week in New York. The meeting plans to include U.S. Reps. Jerrold Nadler and Eliot Engel, both Jewish New York Democrats who have been involved in efforts to secure Pollard’s release, in order to discuss further efforts to ease his draconian parole conditions. Notices for the event did not appear on the Conference of Presidents website, and members of the organization were informed of the meeting by phone rather than the customary email. The unusual move raised speculations that this may have been done to prevent news about the meeting from being leaked, although if so that tactic has failed. 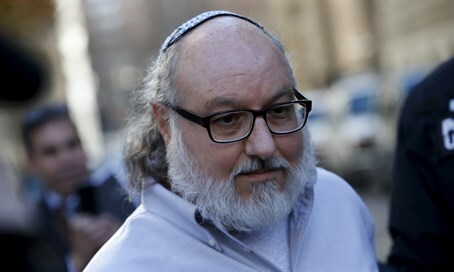 Pollard, a former Navy intelligence analyst, was released from federal prison in November after serving 30 years of a life sentence for passing information about regional threats to the Jewish state. The restrictive conditions for Pollard’s five-year parole include night curfew to his New York home, a ban from leaving the United States and from approaching certain places, including airports and the embassies of Israel, China and South Africa, as well as a requirement to wear a GPS bracelet 24 hours a day. Pollard’s attorney’s argued that the requirement to allow government monitoring of all computers Pollard has access to will deter employers from offering him a job, and that the curfew rules restrict his ability to observe the Shabbat as an Orthodox Jew. Among other issues raised, Pollard and his lawyers also complained that his GPS device requires charging every day, forcing him to use electricity during the Sabbath. The probation officers agreed to extend Pollard’s curfew hours and offered him a GPS bracelet which does not require frequent charging. In a hearing last month, Judge Katherine Forrest of the U.S. District Court in Manhattan sent Pollard’s case back to the U.S. Parole Commission for further review.